On Tuesday, 28th. November 2017 five Scouts: Beth, Toby, Leo, Sophie and Sam were all invested, but being a very special Scout Troop our Scouts are invested in a very special and very memorable place for them, a place where at good times or bad they can return to reflect on the great times that they have had in their scouting, making their world feel a much better place for being in the Scouts and for their lives generally. 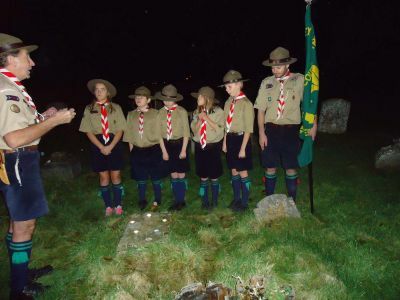 The Scouts were invested on a cold evening where the importance of the event made us all feel very warm inside; invested in St. Mary�s Church graveyard on the edge of a Saxon Warrior�s grave with the rest of the Scout Troop facing the new recruits. Candles were lit by each of the five Scouts around the grave and then the investitures took place with ASM Stitchy holding the Scout Troop flag whilst the Scouts placed their left hand on the flag and saluted with their right hand whilst making their Scout Promise and acknowledging their obedience to the Scout Law. Following the investiture, Skip gave a short talk on the Saxon Warrior buried in this spot, his long journey from Germany, Denmark or possibly Holland on a long boat with a single sail across the North Sea, and before the times of the Vikings, what an adventure, what he must have seen on his journey, what a great experience, with this in mind you Scouts just invested should also seek to make your lives full of great journeys and experiences by grabbing every opportunity open to you, whilst living up to your Scout Promise and Scout Law confirmed this evening. The Scouts were then dismissed and it was back to the hall for hot chocolate and biscuits, followed by Scout Work and games, an evening to be remembered.